Thomas Becket, by his contemporaries more commonly called Thomas of London, English chancellor and Archbishop of Canterbury under King Henry II, was born about the year 1118 in London. His mother was a native of Caen; his father, who came of a family of small Norman landowners, had been a citizen of Rouen, but migrated to London before the birth of Thomas, and held at one time the dignified office of portreeve, although he ended his life in straitened circumstances. The young Thomas received an excellent education. At the age of ten he was put to school with the canons of Merton priory in Surrey. Later he spent some time in the schools of London, which enjoyed at that time a high reputation, and finally studied theology at Paris. Returning at the age of twenty-two he was compelled, through the misfortunes of his parents, to become a notary in the service of a wealthy kinsman, Osbert Huit Deniers, who was of some importance in London politics. About 1142 a family friend brought Thomas under the notice of Archbishop Theobald, of whose household he at once became an inmate. He accompanied the primate to Rome in 1143, and also to the council of Reims (1148), which Theobald attended in defiance of a prohibition from the king. It appears to have been at some time between the dates of these two journeys that he visited Bologna and Auxerre, and began those studies in the canon law to which he was in no small degree indebted for his subsequent advancement and misfortunes. Although the bent of his mind was legal, he never made himself an expert jurist; but he had the art of turning his knowledge, such as it was, to excellent account. In 1151 he was sent to Rome by the archbishop with instructions to dissuade the Curia from sanctioning the coronation of Stephen's eldest son Eustace. It is said that Thomas distinguished himself by the ability with which he executed his commission; in any case it gave him a claim on the gratitude of the Angevin party which was not forgotten. In 1154 he was promoted to be archdeacon of Canterbury, after first taking deacon's orders. In the following year Henry II, at the primate's recommendation, bestowed on him the important office of chancellor. In this capacity Thomas controlled the issue of royal writs and the distribution of ecclesiastical patronage; but it was more important for his future that he had ample opportunities of exercising his personal fascination upon a prince who was comparatively inexperienced, and thirteen or fourteen years his junior. He became Henry's bosom friend and was consulted in all affairs of state. It had been the hope of Theobald that Becket's influence would be exercised to support the extensive privileges which the Church had wrested from Stephen. But the chancellor, although preserving friendly relations with his old patron, subordinated the interests of the Church to those of his new master. Under his administration the Church was severely taxed for the prosecution of Henry's foreign wars; and the chancellor incurred the reproach "of plunging his sword into the bowels of his mother." Like Thomas Wolsey he identified himself with the military aspirations of his sovereign. It was Thomas who organized the Toulouse campaign of 1159; even in the field he made himself conspicuous by commanding a company of knights, directing the work of devastation, and superintending the conduct of the war after the king had withdrawn his presence from the camp. When there was war with France upon the Norman border, the chancellor acted as Henry's representative; and on one occasion engaged in single combat and unhorsed a French knight of reputation. Later it fell to his part to arrange the terms of peace with France. He discharged the duties of an envoy with equal magnificence and dexterity; the treaty of May 1160, which put an end to the war, was of his making. In 1162 he was transferred to a new sphere of action. Henry bestowed on him the see of Canterbury, left vacant by the death of Theobald. The appointment caused some murmurs; since Becket, at the time when it was made, was still a simple deacon. But it had been desired by Theobald as the one means of averting an attack on clerical privileges which had been impending almost since the accession of Henry II; and the bishops accepted it in silence. Henry on his side looked to find in Becket the archbishop a coadjutor as loyal as Becket the archdeacon; and anticipated that the Church would once more be reduced to that state of dependence in which she had stood during the latter years of King Henry I. Becket, however, disappointed all the conflicting expectations excited by his appointment. He did not allow himself to be made the king's tool; nor on the other hand did he attempt to protect the Church by humoring the king in ordinary matters. He devoted himself to ascetic practices, confined himself to the society of churchmen, and resigned the chancellorship in spite of a papal dispensation (procured by the king) which authorized him to hold that office concurrently with the primacy. By nature a violent partisan, the archbishop now showed himself the uncompromising champion of his order and his see. Hence he was on the worst of terms with the king before a year had elapsed. They came into open conflict at the council of Woodstock (July 1163), when Becket successfully opposed the king's proposal that a land-tax, known as the sheriff's aid, which formed part of that official's salary, should be henceforth paid into the Exchequer. But there were more serious differences in the background. Becket had not shrunk from excommunicating a tenant in chief who had encroached upon the lands of Canterbury, and had protected against the royal courts a clerk named Philip de Brois who was charged with an assault upon a royal officer. These disputes involved questions of principle which had long occupied Henry's attention, and Becket's defiant attitude was answered by the famous Constitutions of Clarendon, in which the king defined, professedly according to ancient use and custom, the relations of Church and State. Becket and the bishops were required to give these constitutions their approval. Henry's demands were more defensible in substance than might be supposed from the manner in which he pressed them on the bishops. On the most burning question, that of criminous clerks, he offered a compromise. He was willing that the accused should be tried in the ecclesiastical courts provided that the punishment of the guilty were left to the lay power. Becket's opposition rested upon a casuistic interpretation of the canon law, and an extravagant conception of the dignity attaching to the priesthood; he showed, moreover, a disposition to quibble, to equivocate, and to make promises which he had no intention of fulfilling. His conduct may be excused on the ground that the bishops were subjected to unwarrantable intimidation. But when he renounced his promise to observe the constitutions his conduct was reprobated by the other bishops, although approved by the pope. 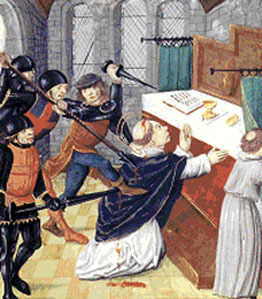 It was fortunate for Becket's reputation that Henry punished him for his change of front by a systematic persecution in the forms of law. The archbishop was thus enabled to invoke the pope's assistance, and to quit the country with some show of dignity. Becket fled to France in November 1164. He at once succeeded in obtaining from Alexander III a formal condemnation of the constitutions. But Alexander, a fugitive from Italy and menaced by an alliance of the emperor with an antipope, was indisposed to take extreme measures against Henry; and six years elapsed before the king found himself definitely confronted with the choice between an interdict and a surrender. For the greater part of this time the archbishop resided at the Burgundian monastery of Pontigny, constantly engaged in negotiations with Alexander, whose hand he desired to force, and with Henry, from whom he hoped to extract an unconditional submission. In 1166 Becket received from the pope a commission to publish what censures he thought fit; of which he at once availed himself to excommunicate the king's principal counsellors. In 1169 he took the same step against two of the royalist bishops. In more sweeping measures, however, the pope refused to support him, until in 1170 Henry infringed the rights of Canterbury by causing Archbishop Roger of York to crown the young king. In that year the threats of the pope forced Henry to a reconciliation which took place later at Fr�teval on the 22nd of July. It was a hollow truce, since the subject of the constitutions was not mentioned; and Thomas returned to England with the determination of riding roughshod over the king's supporters. If he had not given a definite pledge to forgive the bishops who had taken part in the young king's coronation, he had at least raised expectations that he would overlook all past offenses. But the archbishop prevailed upon the pope to suspend the bishops, and before his return published papal letters which, in announcing these sentences, spoke of the constitutions as null and void. It was only to be expected that such a step, which was virtually a declaration of war against the king, should arouse in him the strongest feelings of resentment. The archbishop's murder, perpetrated within a month of his return to England (29th December 1170), was, however, the work of over zealous courtiers and regretted by no one more than Henry. Becket was canonized in 1172. Within a short time his shrine at Canterbury became the resort of innumerable pilgrims. Plenary indulgences were given for a visit to the shrine, and an official register was kept to record the miracles wrought by the relics of the saint. The shrine was magnificently adorned with the gold and silver and jewels offered by the pious. It was plundered by King Henry VIII, to whom the memory of Becket was specially obnoxious; but the reformers were powerless to expunge the name of the saint from the Roman calendar, on which it still remains. Even to those who are in sympathy with the principles for which he fought, the posthumous reputation of Becket must appear strangely exaggerated. It is evident that in the course of his long struggle with the state he fell more and more under the dominion of personal motives. At the last he fought not so much for an idea as for the humiliation of an opponent by whom he had been ungenerously treated. William of Newburgh appears to express the verdict of the most impartial contemporaries when he says that the bishop was zelo justitiae fervidus, utruin autem plene secundum scientiam novit Deus: "burning with zeal for justice, but whether altogether according to wisdom God knows."